(Phys.org)—Americans consume 76 billion eggs per year, and while some of the eggshell waste is used for fertilizer or dietary supplements, the majority of these eggshells are thrown away. In a new study, researchers at Wayne State University in Detroit have developed a method to recycle eggshells, using them as "chemical reactors" to synthesize sulfur-containing nanorods that can be used as battery electrodes. The researchers, led by Assistant Professor Da Deng at Wayne State University, have published a paper on the novel approach in a recent issue of the journal Chemistry of Materials. "A large number of eggs are consumed daily, but the disposal of eggshell waste is still a challenging task," Deng told Phys.org. 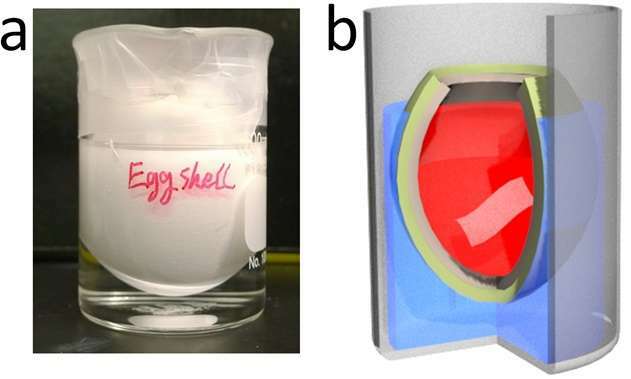 "We outline an idea of the direct use of waste eggshells (or 'trash') as a unique reaction system (or 'treasure') for the synthesis of 1D nanorod arrays on eggshell membrane protein fibers. We prepared a composite of crystalline Co9S8 nanorod arrays on carbon fibers that demonstrate promising performance in both lithium- and sodium-ion batteries." In order to recycle eggshells for existing uses, such as fertilizer and dietary supplements, the two parts must be separated using expensive separation processes. One advantage of recycling the eggshells as multifunctional reactors for making battery electrodes is that the two parts do not need to be separated, since both parts are used together. A partially intact hard shell, curved like a small vase, is first placed in a larger container and used to separate two solutions: sodium hydroxide (NaOH) on the outside, and cobalt(II) sulfate (CoSO4) on the inside. If these two solutions were to rapidly come into contact with each other, they would react to form crystalline microparticles of cobalt(II) hydroxide (Co(OH)2). The eggshell keeps the two solutions separated for the most part, but since the shell is semi-permeable, it allows some OH- ions to diffuse very slowly from the outside to the inside of the shell. After about four days, the OH- ions raise the pH of the inside solution from 4.8 to 7, making it less acidic. This provides the right conditions for Co(OH)2 to form in the amorphous form instead of the crystalline form. The advantage of having Co(OH)2 in the amorphous form is that it forms a coating on pieces of the eggshell membrane inside the shell. The coated membrane is then removed from the solution and heated for about two hours, which leads to both carbonization and sulfurization. The protein fibers are carbonized, meaning they turn into carbon fibers and, in doing so, they release sulfur. The sulfur reacts with the Co(OH)2 to form cobalt sulfide (Co9S8) nanorods. Cobalt sulfide is a commonly used battery electrode material, though not usually in nanorod form. The final product—carbon fibers coated with cobalt sulfide nanorods—can easily be turned into a slurry for use as battery electrodes. The researchers found that the initial battery prototype exhibits a good performance, including maintaining a stable capacity (540 mAh/g) over 300 cycles at low current, though the capacity decreases at higher currents. This cycling rate outperforms that of lithium-ion batteries that use cobalt sulfide films as electrodes. The researchers attribute this improvement to the cobalt sulfide's nanorod structure. They explain that the nanorods are firmly attached on the carbon fibers, and the carbon fibers enhance contact between the electrode and electrolyte to improve the flow of current. Although this method requires that the eggshells be kept mostly intact, the researchers think that this requirement could be met by eggs prepared in commercial facilities. "Food manufacturers use a large quantity of eggs," Deng said. "They could provide the eggshells needed. Our technology requires the use of the eggshells in the form of a container, not in the form of pieces of totally smashed eggshells. If the eggs could be broken by an egg cracking machine into containers, it should be possible to preserve the form needed as 'reactors.' For example, a half eggshell could still function as a container, but a smaller container as compared to the one we demonstrated in our paper, where we carefully cut a small hole in the eggshell." Looking forward, cobalt sulfide has many other applications besides as a battery electrode material, such as in supercapacitors, solar cells, and catalysis. Usually, preparing nanostructured cobalt sulfide requires high pressures, toxic and expensive materials, and complex methods. With further refinements, the eggshell method could help alleviate some of these problems. In addition, future research on this method of using eggshells as reactors could lead to the synthesis of other types of nanostructured materials for a variety of uses. "We plan to explore the direct use of the eggshell reactor system to synthesize many other functional materials, which can find applications beyond batteries," Deng said.